From the second link, here’s the context as they see it: “On April 4 last year, the EU Parliament made a resolution to introduce a single certification scheme for palm oil entering the EU market and phase out the use of palm oil based biodiesel by the end of 2020. On Oct 23 last year, Industry, Research & Energy Committee (ITRE) endorsed the move and this was followed by support by the Parliament’s Environmental Committee (ENVI) on Nov 28. There seem to be a couple of concerns from the Asian side. First, any biofuels exclusion policy in the EU, secondly, what any ban might mean for other uses of palm oil, in of course, food and cosmetics. From the European side, there have been mutterings about some retailers trying to get out of palm oil altogether, whilst others I’ve spoken to point out that availability, cost and impacts of alternatives on land use mean that’s extremely difficult, if not impossible, for a company of any size. 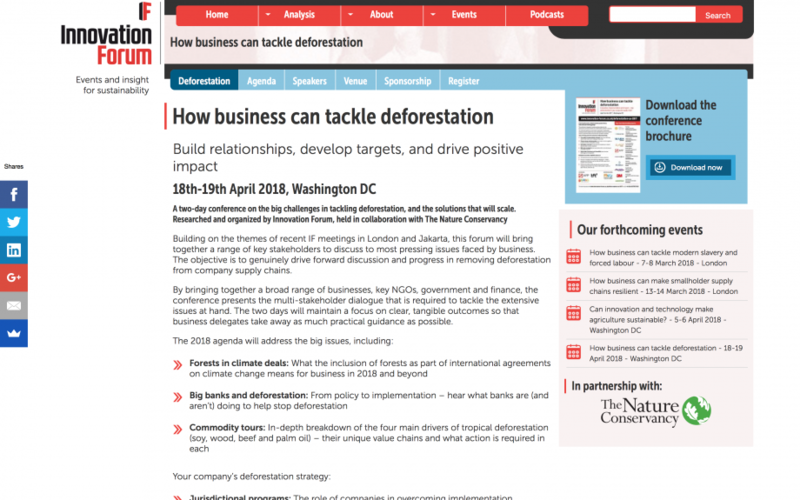 ONE: Will the 2020 Zero Deforestation Commitments made by consumer goods firms be met by 2020? Comment: The answer, with perhaps the odd exception somewhere, seems to be No, whilst definitions are often still unclear. TWO: Which commitments made, have actually made a difference, and how do companies talk about them? Comment: It’s hard to find a positive headline when you miss a big target, but some achievements WILL be noteworthy. How companies talk about these will be important, particularly as definitions such as “zero net” are technical minefields, once you get down into the weeds. THREE: What does this mean for hot button issues like palm oil in USA or Europe? Will there be a serious attempt to shift away? What are the economics? Comment: We don’t know yet, obviously. But the ongoing war of words on palm oil is not helping. Whilst the economics (and practicalities of alternatives to palm kernel derivatives) are not supportive, that doesn’t stop campaigns, consumer concerns and changes in policies such as those around biofuels. FOUR: How should companies tackle the lack of expertise on the ground, in forests, communities and plantations, and can better stakeholder relations help? Comment: This is tricky, given that companies have under-invested in the area, largely pushed the onus onto suppliers, who have also under-invested, and brands have often refused to pay premiums for better palm oil. On the NGO and ‘implementer’ side, companies often tell me there is a huge lack of on the ground capacity to help implement programmes and policies, even when the money is there. This is perhaps the most important question, in the long term, alongside the problems of the institutional operating environment. FIVE: What will the campaigning NGOs do as the missing of these targets starts to become obvious? Support, or campaign? Comment: I believe some are undecided, but we know what the default option usually is for them. My bet would be that the leaders will take a beating when 2020 looms on the horizon, even in advance of the deadline (even presuming the 2020 deadline is 31st December 2020 rather than 1 January 2020!) Once the members of the Accountability Framework become more active and consistent, their combined work may have a significant impact. SIX: What about the backlash? Progress has been made by companies in the last 10 years, but it is still very variable in terms of proactive action on the ground. So no doubt there is a LOT more work to do. The influence of European and North American FMCG companies to drive a fundamental change has diminished since 2010. Even leaving aside the well-worn mantra about India and China, the rise of Pakistan, Bangladesh, Indonesia, Malaysia, Philippines as markets for palm oil, results in a very different market dynamic. Linked to the above two points, we may be heading for a two tier market with no leverage over the laggards – NGOs do not seem to have much appetite or strategy for focusing upon companies other than European/North American ones, which continues to reinforce the two tier market and reduces their (NGO) influence. This will only be reinforced as we get to the point when the leaders have cleaned up their supply chains and can demonstrate 0% deforestation. The (almost exclusive) focus upon companies in the last 5 years has left a gap in approaches to Governments. Groups such as TFA 2020 are making headway in narrowing this, but there is a very long way to go, given the institutional barriers and economics/nationalist concerns that come up quickly in many countries. There is little co-ordinated attempt to tackle other forms of deforestation (infrastructure, mining etc), and the role of the finance sector. We do our best at our Innovation Forum events, but it’s a struggle. Not long ago, one forward-thinking FMCG firm had to subsidise event participation from a number of mid-ranking analysts at big banks, just to get them in the room. They said they thought the conference was brilliant, and we never heard from them again. Overall, it’s perhaps time for a reset of the thinking on how we as a ‘community’, working in sustainable business, view deforestation and what we need to focus upon. This is not an attempt to deflect attention from consumer goods companies, but it is an attempt to ask a legitimate question if we should continue with more of the same, or if the changed circumstances listed above warrant a new emphasis or even direction post 2020. Having this discussion, and aiming to get some consensus would be a debate worth entering now, 1000 days from the 2020 commitment. Can we get some things straight about the EU proposal? Firstly it’s not a ban per se. Palm oil won’t be allowed to be included in calculations linked to a company or country contribution to renewable energy target. That is not the same as a palm oil ban. Second, the regulation is not final. The trilogue process will determine exactly what rules are set around food oil contributions are to biofuels in Europe in the period 2021 to 2030. The conversation around how we halt deforestation must be better linked to how we plan to feed a growing global population. We need to stop demonising agribusiness which still leads the charge in putting food on the table literally and figuratively, and start embracing that farming and the business structures that surround it need to evolve. There is progress being made. Credit, where it is due, should be given and a continued resolve to tackle the really thorny problems ahead of us needed. I think it is a little unfair to simply state there is a lack of appetite for tackling Indian and Chinese markets. RSPO has spent a lot of time, effort and money in trying to do just this. The model of sustainable palm demanding a premium is a significant hindrance in these markets. The current land base in production of palm oil produces more product per hectare than any other oil crop. It is not logical to fight for removal of this area to another use any more than it is logical to remove any other crop land from production. The argument here is “get over it”. However, the expansion of oil palm is a threat to tropical forest. This is true of other oil crops. Any agricultural expansion that replaces natural environment needs to be jassessed for impact and restricted accordingly. Natural environment is increasing exponentially in value as degradation and misuse have exceeded earth’s capacity, not least in terms of climate management. Let there be transparency as to the “debt” to nature of all anthropogenic activity, agricultural or not. Take a look at forest management iver a few centuries in developed countries as a horrific example. we can’t maintain the current status quo as world population expands to 9 to 10 Bn – and rapid population growth in countries that have tropical rainforests. The populations consume oils and fats and need stearin feedstock for shortening, detergents, soaps, etc so there has to be increased production. Those in the palm oil supply chain could probably validate future zero deforestation – but there could be a substitution effect – palm oil suppliers could possibly shift into already cleared areas used for other agriculture – rice, ranching, etc and then those agricultural enterprises may shift into undertaking deforestation. Of course there will be some improvement in productivity (yield/ha) over time due to genetics and GAP. Nothing comes close to oil palm in terms of oil yield/ha, sustainable farming, low carbon footprint, etc. The alternative in Brazil has been GMO soybean supplying soybean meal and soybean oil to countries such as China. And for those who promote biofuels as an alternative to fossil fuels again palm oil is the champion. This whole discussion reminds me of high school chemistry – for every action there is a reaction.